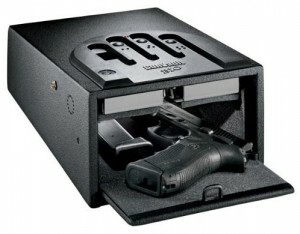 The Gunvault GVB1000 Mini Vault Biometric Gun Safe runs on 9V batteries and can store up to 30 fingerprints. It is also intuitive and updates slight changes that might occur over time to an enrolled fingerprint. 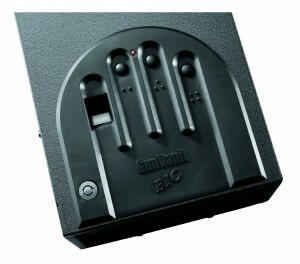 The patented No-Eyes keypad and biometric pad make it easy to operate the safe, even in low-light conditions. According to the manufacturer, this safe has an improved high-strength lock mechanism. Tampering with it using hand tools won’t be enough to pry open the door, thanks to its precise fittings. You can also be informed of invalid entry attempts with its tamper indicator feature. This product has garnered 23 reviews to date on retail site Amazon.com. Reviews are mixed, with 13 customers giving the GVB1000 high ratings and 10 users giving it a rating of 3 stars or less. Fingerprint reader is slow – A number of customers have complained that the fingerprint reader on this model has some difficulty recognizing fingerprints quickly. It can take multiple attempts before you can successfully open the safe. Problems with the door – Reviewers have also described instances where the scanner recognizes their fingerprint, but the door does not open. Calls to customer service were made and they were advised to either hit the safe with their hand or use a screwdriver to pry open the top portion of the door. Some users report that they had to open their safes in this frustrating manner since then. Easy to program – Storing fingerprints is relatively easy. There are no complicated instructions to follow. All you need is common sense to operate the controls. Easy installation – Assembling parts is a no-brainer. The safe could be up and running in less than an hour. Sensitive fingerprint reader – Opposite to the experiences described by some reviewers, there are customers who claim that the fingerprint reader on their units were sensitive and responsive almost all of the time. There aren’t that many customer reviews for the Gunvault GVB1000 yet, but based on all the feedback so far, this safe sounds like a fairly decent product. If you simply need a secure place to keep your firearms and valuables out of reach from children, this safe will do. You might experience some problems with the door. It might get jammed sometimes (as a number of customers have reported), but this is a relatively minor problem that can be overlooked. This model is 8 inches wide and about 5 inches tall. If you are looking something that offers a little more space, you might want to check the GVB2000 model. What Are FBI Certified Fingerprint Scanners? Are Biometric Scanners Safe To Use These Days? Why Is It Important To Learn Gun Safety? BestBiometricGunSafes.com is a participant in the Amazon Services LLC Associates Program, an affiliate advertising program designed to provide a means for sites to earn advertising fees by advertising and linking to amazon.com.